How to reduce the space in between two matrices? 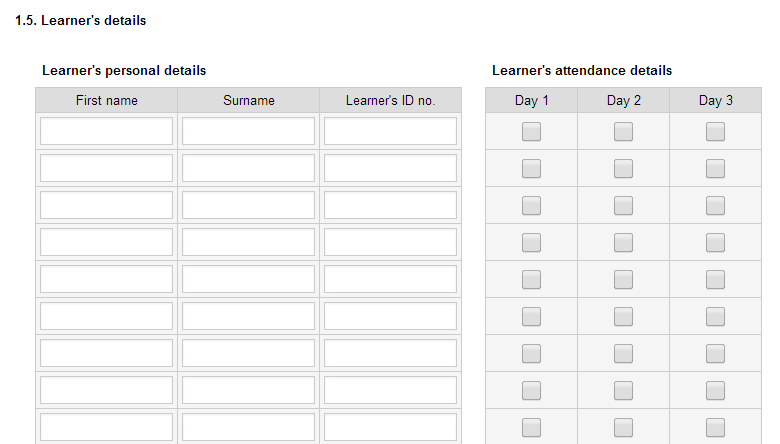 My form has two matrices in Learner's details,one with the text boxes as the input type and other with check boxes as the input type. So considering this i replaced these tables with a configurable list widget and unfortunately the Configurable list widget was not showing the data and takes too much time while on editing the form at the client side,Hence i replace that again back with matrix tables. so how can i make these matrices to have a pretty look like attached picture (with out using configurable list widget)? Do you also need to remove the Matrix field headers (1, 2, 3, 4, etc)? Requirement urgent: yes i need to remove the matrix fields also headers (1,2,3,4,.....25) also. so those two tables looks one and nice. For matrix field numbers try this css. For making checkbox color white I'll have to test it first then update this thread. the problem is i only need to hide the row headers of the matrix id_646 how this is possible? About the checkbox changing it to white I was still looking for a way. I think you need to modify the form source here and create some checkbox image. I have answered a thread before but it was about radio button http://www.jotform.com/answers/295902. Also if you aren't aware of our widgets we actually have few checkbox widgets that you can try. You can view them in our widget page http://widgets.jotform.com/search/checkbox. You are welcome. Feel free to contact us again if you have questions or concerns.